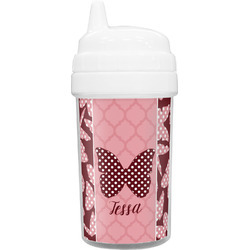 Our personalized toddler sippy cups are perfect for helping toddlers transition from baby bottles to sippy cups with ease and are also ideal for kids on the go! The cups are both stylish and practical with their colorful designs, twist off tops for easy filling and cleaning, and sippy nozzles that can help reduce spills. Thanks so much for the fast service. The cup looks great. Can't wait to use it! I ordered three of these from my grandbaby and she loves them. They use them at daycare and home and they do not leak. They are really cute and are perfect for the daycare so there is no mistaking who's sippy cup these belong to. I am also really impressed with the easy order and extra early delivery even over the holiday the cups arrived a week early! Great customer service. Just like the photo...like it! Purchased for my grandson And it arrived quickly and is so cute I washed it and filled it with water & it did not leak. I can not wait for him to see it.